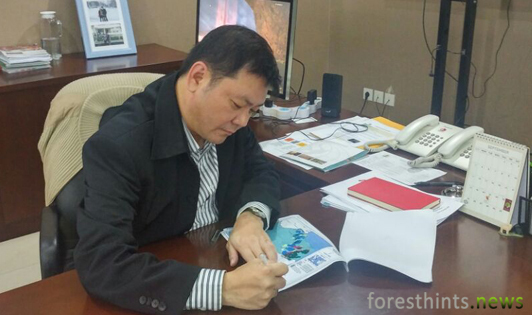 JAKARTA (foresthints.news) - A peatland restoration indicative map covering 2.5 million hectares, roughly 35 times the size of Singapore, has been signed by the Chief of Indonesia's Peatland Restoration Agency, Nazir Foead, in the form of a decree dated 14 September 2016. “This peatland restoration indicative map is a concrete manifestation of President Jokowi’s great commitment to restoring last year's burned peatlands as well as saving existing peat domes,” Nazir told foresthints.news on Monday (Sep 19) at his office in Jakarta. In accordance with what was established by presidential regulation, this indicative map covers the seven priority provinces of Jambi, Riau, South Sumatra, West Kalimantan, Central Kalimantan, South Kalimantan and Papua. The peatland restoration priorities in the indicative map include last year’s burned peatlands, along with peat domes which have been subjected to canal development and those which haven’t. “The restoration of burned peatlands and saving of peat domes are among the primary concerns of the indicative map. The indicative map adequately represents the implementation of the president’s instruction,” Nazir explained. He went on to say that, given that the map is indicative in nature, it opens up opportunities for companies whose concessions are located in peat domes earmarked for restoration to verify the accuracy of the indicative map. He added that the agency would show a certain amount of flexibility in accommodating various views of the map. The Peat Agency Chief reaffirmed that a regulation on the procedures for carrying out peatland restoration will also be issued very soon. Nazir pointed out that this regulation will serve as the main legal frame of reference for peatland restoration, bearing in mind that this regulation represents a follow-up to the presidential regulation which formed the peatland restoration agency until 2020. The peatland restoration indicative map encompasses peatlands distributed in concession areas measuring more than 1.4 million hectares, the majority of which feature peat domes designated for significant restoration and rescue efforts. Peatlands situated in protection zones, comprising an area of almost 685 thousand hectares and mainly located in Central Kalimantan province, have also been assigned for restoration. Meanwhile, peatlands located in cultivation zones outside of concession areas, consisting of almost 400 thousand hectares, are also to be included in peatland restoration. Of the more than 450 thousand hectares of peat restoration to be undertaken in concession areas in South Sumatra province, the majority is in pulpwood concessions belonging to the Sinarmas Forestry Group in the regencies of Ogan Komering Ilir (OKI) and Musi Banyuasin, two of the four regencies prioritized for peatland restoration following last year’s massive peat fires. In Riau province, meanwhile, more than 725 thousand hectares of peatlands in concession areas have been designated for restoration. A glance at the indicative map shows that the bulk of these are located in peat domes found in concession areas, most notably pulpwood concessions. After last year’s hugely destructive peat fires, President Joko Widodo appears completely unwilling to compromise when it comes to peatland restoration efforts. On various occasions, the President has made a point of warning that the peat fires that have recurred every year over the last two decades have to be stopped, beginning from this year.